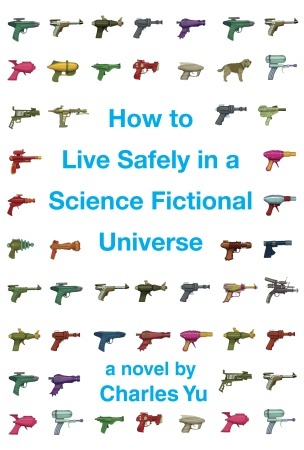 The Broke and the Bookish : Paula fawns over "How to Live Safely In A Science Fictional Universe"
Paula fawns over "How to Live Safely In A Science Fictional Universe"
From the moment I saw this book I knew I wanted to read it. I never actually read the synopsis, I just loved the title and hoped that whatever it offered would be wonderful. I expected a fun science fiction adventure novel that would be an easy read, what I got was a super meta-fiction mindwarp but it was awesome. It took effort to read, but it was still a very fun read. The protagonist of the story is Charles Yu (note: also the author) who lives in his time machine (which is approximately the size of a phone booth, and unlike Doctor Who’s TARDIS, it is not bigger than it looks). He is in love with the computer in his ship and his boss is a computer program who doesn’t realize he’s not actually alive. His job is to go fix other time machines, which people have bought and broke in their attempt to change their past, which he states over and over is impossible to do. He has been in his time machine for years, but he is only gone for a day every time he goes to the station. So he has had an apartment for a week total - and the landlord thinks he's just rapidly aging. The first half of the story consists of Charles’ stories and thoughts. He shares stories about his father, who was the inventor of the time machine. Thoughts about things like “The Girl He Will Not Marry”, who is also the Girl He Has Never Met. He tells how he and the girl he never met would never have a wonderful life together. He muses on how when he brushes his teeth, his reflection looks disappointed in himself. He also shares stories of the people he retrieves from the past. In fact, his entire job exists to save people from themselves. And yet, he doesn't do a very good job of making sure his own life is in order. The first half of the books is full of amusing “such is life” kind of thoughts and is quite enjoyable. But it’s the second half of the story that really gets meta and mind boggling (but no less enjoyable). I wont tell you how, but Charles ends up getting himself stuck in a time loop. He is given the book “How to Live Safely In a Science Fiction Universe” by Charles Yu – but the problem is, he hasn’t written it yet. So he ends up reading it before he’s written it. Ugh just typing this is making my brain go “Huh?” Eventually the story gets resolved (or as resolved as a time-loop can be). It's brilliant, beautiful and funny. I wont give too much more away. But I highly suggest you go read this book before you get stuck in a time loop. I've had this book on my TBR list for months and haven't been able to find a copy! Glad you liked it, but this just makes me want it more =) Great review! I've been wanting to read this for awhile now. I can't wait to get to it now! That title is something else. Doesn't sound like my type of book though. The title completely drew me in as well. I had no idea what it was about - and didn't care either. I haven't managed to get around to it yet, but I'm so glad to hear it's that good! The cover is fabulous. I like the idea too but it does sound like it turns into a brain bruise for a minute. I'm OK with that in time travel stories though. :-) I'll have to see if I can find this one. I just recently came across this book and must say it sounds geekily awesome. So glad you liked it! Great review! great review... I think my hubbie would love this... and I might like it too! Great review! I really tried to get into the book, but ultimately found it a little too obtuse for my liking.